Tatsuo Sato joined Aerospace Dept. of Mitsubishi Corporation in April 1971 after graduating from Keio University with a bachelor’s degree in Administrative Engineering. For 25 years until he was appointed General Manager of Aerospace Dept. in June 1996, he was in charge of marketing major defense systems for Japan Self Defense Forces (JSDF). He served as a project leader at Mitsubishi Corporation for the sales of Multiple Launch Rocket System for the Ground Self Defense Force, P-3C Anti-Submarine Aircraft and SQS-58 Sonar System for Maritime Self Defense Force as well as AIM-9L Sidewinder (infrared guided air-to-air missile) and Patriot Surface to Air Missile System for Air Self Defense Force. From June 1985 through March 1989, he was posted to Mitsubishi International Corporation's Boston Office as a manager responsible for the implementation of Raytheon’s Japan Defense Programs including the license production of the Patriot System. 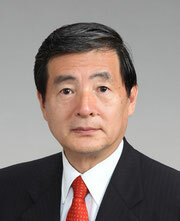 From September 1989 through October 1992, he served as one of the official members in Phase 1 through Phase 4 of WESTPAC (Western Pacific Missile Defense Architecture Study), the first contract that Japanese defense industry led by Mitsubishi Heavy Industries, Ltd. signed with the U.S. DOD (Department of Defense). This study contributed in forming the base of today’s two tiers BMD (Ballistic Missile Defense) System consisting of Patriot PAC-3 and SM-3. In 1994, he concluded a regional affiliate agreement with Space Imaging of the U.S. which led to the establishment of Japan Space Imaging (JSI) in 1998. JSI became one of the leading companies in Japan specialized in data collection, processing and sales of high resolution satellite imagery. In June 1996, he was appointed as the General Manager of Aerospace Dept. With the introduction of business unit system, he was appointed as the Business Unit Manager of New Business Initiative responsible for developing new business centering around defense area in April 1997. Infosec Corp., which was established in 2001 through this new initiative, developed into one of the leading companies providing comprehensive and optimum information security solution in Japan. With his appointment as Deputy Chief Operating Officer of Aerospace Div. in April 1999, he started to be involved in all business areas of the Division. In this role, he concentrated in expanding aircraft leasing business and developed it into an operation with portfolio of about 40 Boeing/Airbus aircraft. In April 2000, he was appointed SVP and Division COO of Aerospace Div. consisting of six business units, Defense, Space, Airline, New Business Initiative, IT and Spatial Data and Satellite Communication. In June 2001, he was promoted to Corporate Officer. In June 2006, he retired from active duty, and was appointed as a full time Corporate Advisor in charge of aerospace business reporting to the CEO of Mitsubishi Corporation. In November 2008, he was appointed CEO of MC Aviation Partners (MCAP), a subsidiary of Mitsubishi Corporation, which was established in August 2008 with portfolio of 50 aircraft worth $1.8 billion. He developed MCAP into an aircraft lessor with a portfolio of 100 plus aircraft worth $3.5 billion. In May 2012, he resigned as CEO of MCAP and joined Global Insight Corp. as Chairman in August 2012.